Jakob and Hans Strüb were two brothers who were active as painters in early 16th-century Germany. They probably trained with their father, the painter Peter Strüb the Elder. Both specialised in large-scale altarpieces and may also have produced the sculptural elements of such ensembles. The present work was originally part of a large altarpiece in the church of Saint John the Baptist in the Augustinian monastery of Inzigkofen. It was subsequently broken up into fourteen panels in order to be sold. The present panel depicts The Visitation, an episode recounted in the Gospel of Saint Luke. It is located outdoors in front of the house of the Virgin’s cousin Elizabeth, with the two women shown embracing. The unusual way of representing their pregnant condition follows the French and German tradition, with a small child depicted in their stomachs. Christ appears surrounded by rays of light with his cousin Saint John kneeling before him. The backgrounds are painted in gold, following the traditional, popular format. The composition reveals clear stylistic similarities with the work of Bernhard Strigel, another German master, for example, in the use of the arch that frames the scene. 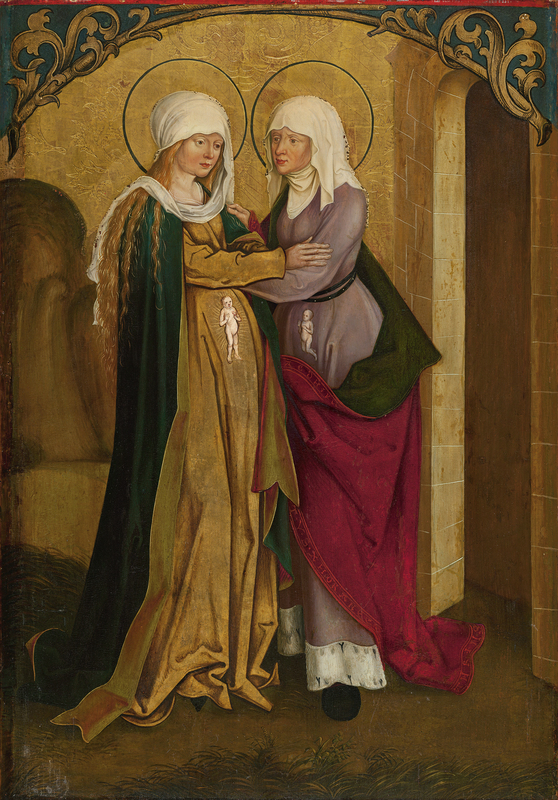 The Visitation was acquired from the Kleinberger galleries in New York in August 1929. Together with other panels that have been identified, it formed part of an altarpiece in the choir of the church of Saint John the Baptist in the Augustinian monastery of Inzigkoven near Sigmaringen. This information derives from a document of 1525 that records the names of the artists, the year of execution and amount paid. The monastery was secularised in 1803, at which date it is likely that it was decided to sell the entire polyptych. In 1830 it was owned by some farmers near Wald in Hohenzollern, where it was discovered by a private individual. In 1840 the wings of the polyptych were separated and divided into separate panels. Most of the scenes from the wing to which the present panel belonged, which was hypothetically reconstructed by Ingenhoff, are in the collection of the Counts of Hohenzollern, apart from a panel of The Circumcision in the Gemäldegalerie, Berlin. According to Ingenhoff ’s reconstruction, the other episodes that would have accompanied the present one on this door devoted to the life of the Virgin were: The Presentation in the Temple, The Annunciation, the above-mentioned Circumcision, and four more panels with pairs of saints. It is known that in 1861 the present panel belonged to a restorer in Munich. At that point the infants in the wombs of Mary and Elizabeth were covered over, as were the sexual organs of the Christ Child in the scene of The Circumcision. These later overpaintings, which in the case of the present work modified the original concept of the painting, were removed in 1987. Photographs taken prior to that date show the two women without these important elements. The artist depicted the biblical episode with the essential elements, placing all the emphasis on the embrace of the two women and on the message that this gesture conveys through his emphasis on their pregnant state. The event described by Saint Luke takes place in a simple exterior setting with the entrance to Elizabeth’s house on the right, a rock on the left and plants and grass on the ground, the latter functioning to indicate that this is an interior. The tiny images of infants inside the women’s bodies —which are to be found in German and French painting and sculpture — represent Christ blessing, surrounded by rays of light while the Infant Saint John the Baptist kneels in sign of devotion. The figures are characteristic of the Strüb brothers in the stylized faces and bony hands, while they have also been compared to the style of Bernhard Strigel. There are other similarities in the way that the scene is organised, with the low-topped arch constructed from foliate elements. It has been suggested that Strigel’s Blaubeurer Altarpiece may have directly inspired the present panel with regard to these elements.